The impact of transitions in sonar technology at ADF&G sonar sites on escapement goals has been a source of confusion in some of Alaska’s salmon fisheries. Between 2002 and 2011 many sonar sites transitioned from Bendix sonar systems to a newer sonar technology known as DIDSON. In comparative studies conducted between the two technologies ADF&G biologists found that in most rivers they could detect fish better using DIDSON and established new escapement goals to account for the improved counting method. In some cases the resulting escapement goal change was minor and in some cases it was significant. For more details see the bottom of this page or this comparison report (PDF 9,584 kB). Biological Escapement Goals (BEGs) and Sustainable Escapement Goals (SEGs) are the most important goals used for management. 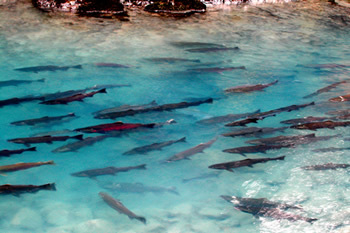 These two goals are established based on the number of salmon, by stock and river system, that need to escape to spawn to provide for sustained yields in the future. BEGs and SEGs are determined through ADF&G research programs. Biological Escapement Goal (BEG): The escapement that provides the greatest potential for maximum sustained yield; BEG will be the primary management objective for the escapement unless an optimal escapement goal or inriver run goal has been adopted; BEG will be developed from the best biological information, and should be scientifically defensible on the basis of available biological information; BEG will be determined by the department and will be expressed as a range based on factors such as salmon stock productivity and data uncertainty; the department will seek to maintain evenly distributed salmon escapements within the bounds of the BEG (from 5 AAC 39.222(f)). Sustainable Escapement Goal (SEG): A level of escapement, indicated by an index or an escapement estimate, that is known to provide for sustained yield over a 5 to 10 year period, used in situations where a BEG cannot be estimated due to the absence of a stock specific catch estimate; the SEG is the primary management objective for the escapement, unless an optimal escapement goal or inriver run goal has been adopted by the board, and will be developed from the best biological information; the SEG will be determined by the department and will be stated as a range that takes into account data uncertainty; the department will seek to maintain escapements within the bounds of the SEG (from 5 AAC 39.222(f)). While BEGs and SEGs are set by ADF&G, Inriver Goals and OEGs are established by the Board of Fisheries. Inriver Goals require ADF&G to leave enough returning salmon unharvested to meet the BEG or SEG and to make a certain number of salmon available for inriver harvests. The OEG can also add fish to the BEG or SEG for inriver fishermen, but may also add fish for escapement when there are uncertainties in the data used to establish a BEG or SEG. Not all of the salmon stocks that ADF&G manages have Inriver Goals or OEGs. Optimal Escapement Goal (OEG): A specific management objective for salmon escapement that considers biological and allocative factors and may differ from the SEG or BEG; an OEG will be sustainable and may be expressed as a range with the lower bound above the level of Sustainable Escapement Threshold, and will be adopted as a regulation by the board; the department will seek to maintain evenly distributed escapements within the bounds of the OEG (from 5 AAC 39.222(f)). 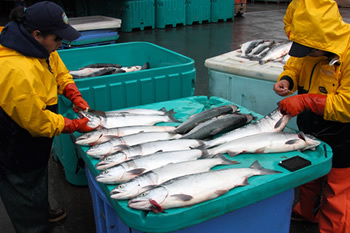 Inriver Goal: A specific management objective for salmon stocks that are subject to harvest upstream of where escapement is estimated; the inriver run goal will be set in regulation by the board and is comprised of the SEG, BEG or OEG, plus specific allocations to inriver fisheries; (from 5 AAC 39.222(f)). In rivers where DIDSON counts fish better than Bendix sonar, escapement goals have increased as ADF&G has converted historical and current escapement data from Bendix to DIDSON units. Goals increased as a result of sonar technology transitions do not put more fish into the river. Just as converting a 50-mile speed limit into an 80-kilometer speed limit does not increase the actual speed at which vehicles are allowed to travel—converting goals from Bendix to DIDSON units does not increase the actual number of fish allowed to escape into a river.